Acquired: Signed as a free agent on July 24, 2017. Contract extended on Jan. 17, 2019. 2018: In 18 games (18 starts), O’Neill recorded 107 punts for 4,832 yards and three singles and 84 kickoffs for 5,167 yards. He also finished with five special teams tackles. 2017: In 13 games (13 starts), O’Neill finished 9 – 13 on field goal attempts and 8 – 10 on PATs. O’Neill also had 73 punts for 3291 yards and 62 kickoffs for 3608 yards, four singles, and two tackles. In the West Semi-Final, O’Neill had six punts for 281 yards and one single and six kickoffs for 341 yards and also one tackle. In the West Final, O’Neill had six punts for 278 yards and five kickoffs for 311 yards as well as one tackle. 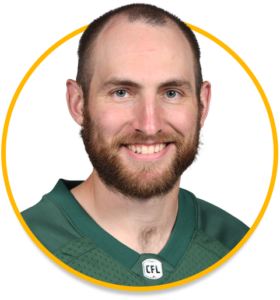 2015: (Hamilton): O’Neill appeared in one game for the Tiger-Cats where he recorded two punts for a 38.5-yard average. 2014: O’Neill appeared in nine games, where he made 20 – 26 field goals and 61 punts for 2,710 yards. In The West Semi-Finals, O’Neill made 3 – 5 field goals and 10 punts for 404 yards. 2013: In eight games, O’Neill made 11 – 16 field goals. (BC) Appearing in four games, O’Neill hit 4 – 5 field goals and recorded 21 punts for 845 yards. 2012: (BC) Was on the Lions Injured Reserve List. 2011: (BC) O’Neill was drafted by the BC Lions in the second round (11th overall) in the 2011 CFL Draft. O’Neill spent the 2011 season on the Injured Reserve List. College: In O’Neill’s senior season, he became the Golden Bears all-time field goal leader with 55 converts. He was also named a Canada West All-star and was named to the CIS East-West Bowl.